Everyone has to deal with stress. It’s a natural part of life, and while most don’t find pleasure in the tensions and pressures of everyday life, a little bit of stress can actually be good for you. It’s when stress becomes persistent (or chronic) that is can begin to negatively affect your health. Luckily, reducing stress can be as simple as taking a few moments to clear your mind and relax your body, which is exactly what the following five-pose yoga sequence is designed to do. Even with just five minutes a day, this series of poses paired with deep, focused breathing will help to reduce and relieve tension, no matter what kind of stressors are thrown your way. Begin in a neutral tabletop position on your hands and knees. Spread your knees slightly and then slowly sit back drawing your rear towards your heels. Keep your arms extended out in front of you with your palms flat on and let your forehead rest gently on the mat. Reach forward through your fingers and breathe into the stretch, holding for 10 slow, deep breaths. Release from child’s pose by slowly returning to all fours, Make sure that your knees are in line with your hips and your wrists with your shoulders. On an exhale, round your spine towards the ceiling as you let your head naturally fall towards the floor (don’t force your chin to your chest). Inhale as you slowly return to the starting position, move through the motion by lifting your chest and head towards the ceiling and sinking your stomach towards the floor for the “cow” portion of the pose. On your next exhale slowly transition back to “cat.” Continue focusing on your breath as you slowly transition between the two poses for about 10 breaths or 60 seconds. Beginning in tabletop position on all fours place your hands shoulder-width distance apart and your knees hip-width distance apart. Tuck your toes under. When you’re ready to lift up, press your hands into the floor and straighten your legs as you push your hips up into the air. Here you can keep your knees slightly bent or straighten the legs, reaching your heels towards the floor. Hold for 10 slow, deep breaths. 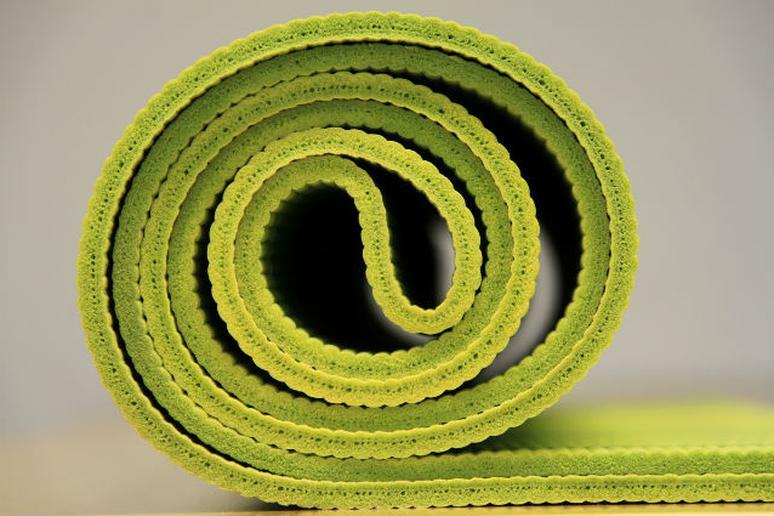 From downward facing dog, slowly walk your feet towards the top of your mat placing them between your hands (try keeping your legs straight as you walk them forward for a deep hamstring stretch). Take a full breath in this forward fold pose before standing up, lifting your torso slowly and rising one vertebrate at a time. Take another deep breath before slowly lowering yourself back to the ground into a seated position with your legs extended in front of you. Keeping your left leg extended, bend your right knee and draw it towards your chest, placing your right foot on the outside of your left thigh. On an inhale, sit up tall and lengthen your spine as you twist to your right, placing your right hand on the floor behind you and your left elbow on the outside of your right knee. Exhale as you sink into the twist and hold for 10 slow, deep breaths, lengthening your spine with each inhale and releasing further into the twist with each exhale. Slowly unwind and re-extend your right leg, then repeat the sequence on the other side. From the seated position, slowly lie down onto your back; bend your knees keeping your feet flat on the floor. On an inhale, draw both knees towards your chest and then wrap your arms around your legs. On an exhale, release your arms and slowly let your legs fall to the right. Rest your arms on the floor, extending them to form a T shape. Hold for 10 slow, deep breaths before slowly and gently untwisting and returning to the starting position. Repeat the sequence on the other side.